Michael Keaton exploded onto movie screens in Ron Howard’s Night Shift (1982) and became Hollywood’s go-to comic actor with his next film, the John Hughes-penned Mr. Mom (1983). (A cringe fest buoyed by Keaton’s perfect spin on every throwaway line.) He arguably peaked with Tim Burton’s Beetlejuice (1988), playing a manic poltergeist (“bio-exorcist”), which he largely improvised. Keaton had Robin Williams’ speed and inventiveness filtered through a hustler’s desperation (Williams started in movies around the same time but Keaton was initially more successful.) Then he did Batman (1989). Keaton became very rich, very famous, and his career never recovered. Alejandro G. Iñárritu has distilled all of the above into Birdman or (The Unexpected Virtue of Ignorance), and created the coolest backstage comedy since All About Eve (1950). Fasten your seat belts… Keaton plays Riggan Thomson, former blockbuster star (Birdman, instead of Batman – the change is transparent but resonates in unexpected ways) who is financing, writing, directing and starring in a Broadway adaptation of Raymond Carver’s What We Talk About When We Talk About Love. His daughter (Emma Stone – wonderful) is just out of rehab, his girlfriend (Andrea Riseborough) is in the play and might be pregnant, his lawyer (Zach Galifianakis – nicely restrained) is trying to keep the production afloat, and his ex-wife (Amy Ryan) is on hand to remind him of everything he’s screwed up over the years. During rehearsal, a light fixture falls on an actor, so the ingénue (Naomi Watts) brings in her lover (Edward Norton) to replace him. Norton is a revelation – playing a “brilliant” actor known for being difficult, he brings his baggage to the part (like Keaton), but also the intense, desperate spirit of those early Michael Keaton performances. It’s what ultimately sparks Riggan back to life. Every “long take” I can remember in movies (e.g. Hitchcock’s Rope, DePalma’s Bonfire of the Vanities, Scorsese’s Goodfellas, Cuarón’s Children of Men) transpired in real time. Iñárritu plays with time – sometimes hours pass as the camera pans. The camera leaves a character in the fly gallery, descends through the rigging and stage lights, and we arrive to find the same character in front of an audience; look ma, no seams! The effect is disorienting and critical to the film’s impact. Iñárritu said he didn’t want obvious cuts because our lives are not edited; to that I’d add, our memories are not clockwork-linear. So the events in this movie are not how things actually happen. There’s a lot of compression and dramatic embellishment, particularly when Riggan confronts a theater critic who tells him, before seeing his play, that she will write the worst possible review, on principle. And Birdman (Keaton’s voice) continually taunts Riggan, eventually materializing to blow things up like a Hollywood badass. Riggan levitates. Or not – Iñárritu works in a magical-realistic mode here; what interests him is emotional truth for the characters. 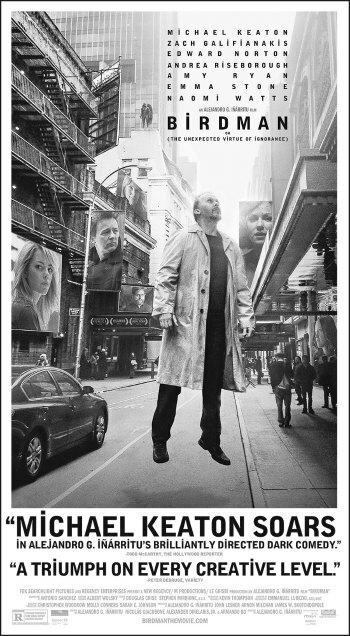 I laughed throughout Birdman, often because it’s funny and sometimes with simple delight. Keaton is heart and soul of the movie (also its id, as Birdman), but he doesn’t play the prankster he used to be. I missed that at first, until I realized Iñárritu imbues every aspect of the production with the “missing” merriment, then delivers Riggan/Keaton in an touching coda. Birdman or (The Unexpected Virtue of Ignorance) is a writer/director’s very specific love letter to a performer (the part was written for Keaton) which becomes universal, as such dedications will. Given the setting, I was reminded of the ultimate Broadway song, What I Did For Love (recall the name of Riggan’s play.) As the credits rolled, I thought that might have made a nice subtitle too. A bit on the nose, maybe (the phrase becomes a pun once you see the film.) Birdman soars.